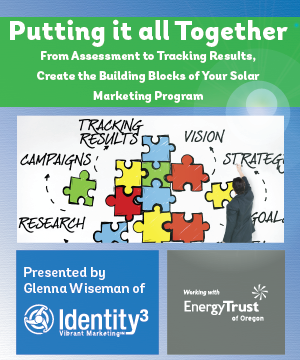 Attend the final #MarketingSolar webinar by Glenna Wiseman of Identity3 to learn how to put the building blocks of your solar marketing campaign together. This training will highlight key points to build your solar marketing program, including taking stock, mapping strategy, campaigns and creative, efficient delivery and tracking results. The program will cover tools to help solar installers take inventory of their marketing program and assets, map strategy, develop customer profiles and track Energy Trust business development funds. Register to attend the webinar on Thursday, June 23 at 11 a.m.
Use the Marketing Solar hashtag, #MarketingSolar, to contribute to the conversation on Twitter. Program webinars are conducted live on the fourth Thursday of each month at 11 a.m. Access all the webinar recordings, tools and podcasts here.